As I’m closing in on my goal of visiting, at least once, every winery in Connecticut, I stopped recently at Holmberg Orchards in Gales Ferry to sample their fruit wines and ciders. A fourth-generation family-owned working farm, Holmberg Orchards has been around since 1896, first as a vegetable farm, and then in the latter half of the 20th century moving to Orchards and fruit. 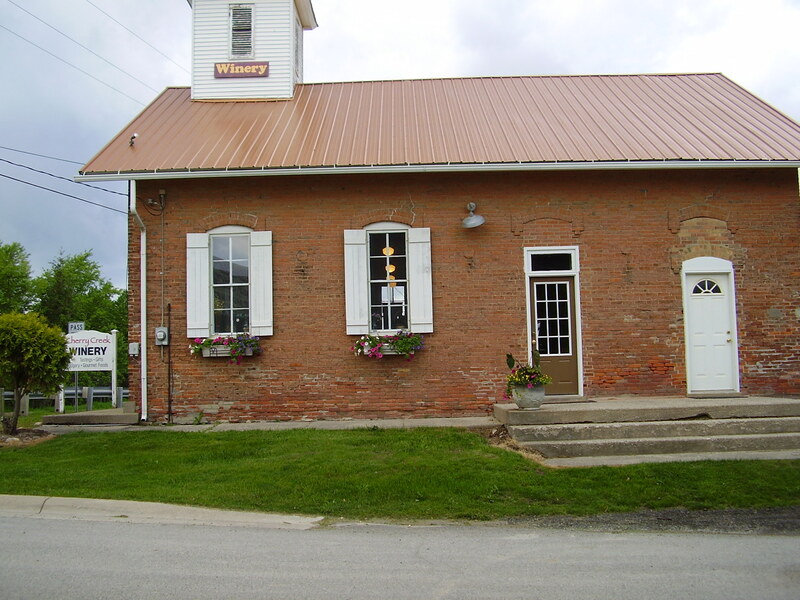 The winery opened in 2007 producing fruit wines and ciders. The winery has done so well that the family planted their first grape vines in 2010 to expand their wine menu and harvested their first crop of Pinot Blanc in 2011. In addition to the winery, Holmberg Orchards has pick-you-own fruit orchards, a bakery and a small retail shop that sits directly on the main road at the foot of a small hill leading back to the wine barn, a small small wooden cabin-like structure that sits at the front of the orchards. The interior of the barn is cool and uncluttered – the space is dominated by a U-shaped tasting bar which occupies the middle of the room. There’s space around the edges of the room for people to move around each other, but not much space for mingling – on busy days, I imagine the overfill simply forms a line out the door. While there are no tables and chairs set up inside the wine barn, there’s a deck off to one side of the structure and plenty of open space on the lawns for those who want to bring a picnic lunch, grab a bottle of wine or cider, and spend a relaxing afternoon in the shade of the Orchards. And if you didn’t bring a picnic lunch, a short drive or walk back down the gravel-lined lane brings you back to the farm store which has a great selection of vegetables, sandwiches, and other foodstuffs, much of it made or grown locally either by Holmberg Orchards or local farmers. While I didn’t stay for the entire afternoon, I did stop at the farm store, picking up some fresh locally-grown sweet corn and a freshly made tomato-spinach-feta quiche which was melt-in-your-mouth good ~ one of the best quiches I’ve ever had in my life. 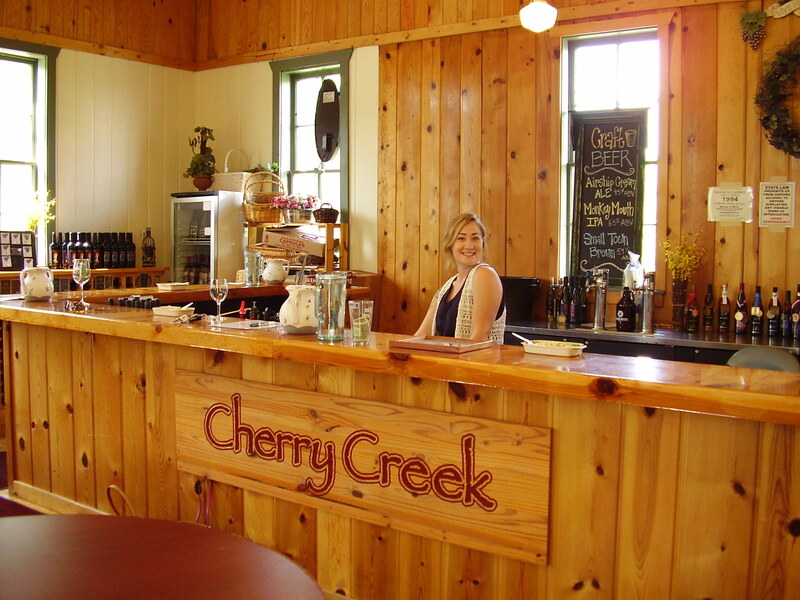 The winery is open from May 1st through the first weekend in November, Saturdays and Sundays 12-5. Tastings are $6 and include the entire wine menu: four wines and three ciders served in a souvenir wine glass. Gales Ferry is only minutes away from the two casinos, Mohegan Sun and Foxwoods, and close to the Mystic/Stonington area and the wineries in the southeast corner of the state. Saturday found me heading south to Wallingford and Connecticut’s newest winery, Paradise Hills Vineyard. Owned and operated by the Ruggerio family, the winery opened to the public on May 1st and has been doing a brisk business all season. The Ruggerios have been in the wine business for more than 15 years, having started growing grapes in nearby Hamden, CT and purchasing the current property in Wallingford and planting the vineyards in 1997. They grow Chardonnay, Chambourcin, Vidal Blanc, Seyval Blanc and Cayuga and because of the age of the vineyards, the vines are well established and produce high quality grapes. For years, Paradise Hill sold their grapes to Jerram Winery in New Hartford, CT, and only recently decided to open their own winery. Like many Connecticut wineries, Paradise Hills is truly a family affair, with multiple generations and branches of the family playing key roles in the winery and vineyards, including construction of the winery building itself. I had the opportunity to spend a few minutes with Paradise Hill’s winemaker, Margaret Ruggerio, who in addition to giving me a bit of the history of the vineyards also discussed the construction of the winery building, which took three years to complete and was constructed primarily by family, friends, and employees of the winery. A graduate of local Lyman Hall high school’s Vocational Agricultural program, Margaret Ruggerio, who also has college degrees in botany and wildlife conservation, is the winery’s principal winemaker, currently producing six wines, four white and two red, each of which, she is proud to point out, are distinct. (More on the wines themselves when we get to the tasting on Thursday). She and the family are committed to sustainable agricultural practices and even constructed the winery building to be as “green” as possible. Which brings us to the winery itself – as mentioned above, construction began about three years ago and with the exception of the foundation, most of the construction was completed by family, friends and vineyard employees. The building is Tuscan-inspired, a nod to the Ruggerio’s Italian heritage, but the clean lines and fresh non-fussily decorated interior provide a touch of New England charm. The building is entirely geo-thermal, the air conditioning and heat are generated from the groundwater below the building. The only traditional electricity that is used in the heating and cooling systems is that needed to run the air handlers to provide air circulation. The family carried through this approach throughout the building, using natural materials as much as possible, and even using hand-harvested cedar trees from the property for the fence posts and rails that line the entrance and walkway. The Tasting Room is a bright, airy, welcoming space, with light green walls, a lovely slate tile floor, and a charming copper-topped bar. The Ruggerios put a lot of thought into the space planning and have incorporated not only space for 16-20 people to stand comfortably at the bar, but enough room behind the bar for the family to move easily as they welcome guests and pour tastings. It’s one of the best planned spaces I’ve seen yet in any winery, with plenty of counter space, a large wine cooler, and depth of room behind the bar so four or five people can move easily around each other. The result is a much more relaxed experience for the customer (at least in my experience), because they appeared less cramped and harried behind the bar, I felt more relaxed in front of it. In addition to the bar, there are also about a dozen bar-height tables and chairs in the main room, and a long covered porch overlooking the Chardonnay vineyard with additional seating. Quite a few people ordered a bottle of wine after their tasting and settled in to enjoy the gorgeous weather – and gorgeous views – from the porch. While no one gets into (or stays in) this business without loving it, it’s obvious after spending even a few minutes with them that winemaking is a real passion and joy for the Ruggerios. Each tasting is accompanied by lots details of the wine, local history, and family stories. I overheard several people comment that it was one of the more detailed and fun tastings they had experienced – and I concur. Coming Thursday – the wines of Paradise Hills and how the Ruggerios are helping to support the next generation. Congratulations to the 2011 Big E Winners! Comments Off on Congratulations to the 2011 Big E Winners! The “Big E,” held every September, is a joint state fair for the six New England states. As part of the agricultural competitions, each June the Big E hosts an annual wine competition for wines produced in New England and New York. This is the premier wine competition here in New England, and our local wineries proudly display the medals won by their wines each year. Some of my favorites from my Rhode Island visits also earned medals: Sakonnet Vineyards 2009 Vidal Blanc, a Gold Medal winner and Newport Vineyards 2010 Riesling, a Silver Medal Winner. A complete list of the 2011 Results can be found on The Big E website, and you can track Vino Verve’s experiences on the Connecticut and Rhode Island wine trails by clicking on the “Win(e)ding Roads” tab above. If you haven’t yet had a chance to sample some of the great local wines the Northeast has to offer – this list is a great place to start. Happy Trails!